This was an interesting experiment. Not because of the taste, but because of the talent. I felt all elbows making these. It was as if all my years of fondant experience had melted away like candy sugar in hot water, and there I was as green as the day I started baking cakes. I used the betty crocker yellow cake mix. The back of the box says to mix everything at once. Don't do it I tell you. Make sure your butter is extra soft. Add it and a bit of the mix to a bowl and beat it well. Add room temperature eggs one at a time and incorporate them well. Add the vanilla and mix well. Then add the rest of the cake flour mix alternately with the water. (First flour, then water, then flour, then the rest of the water and then the rest of the flour.) Beat on high for 3 minutes or so, until the entire thing is very, very, very smooth. 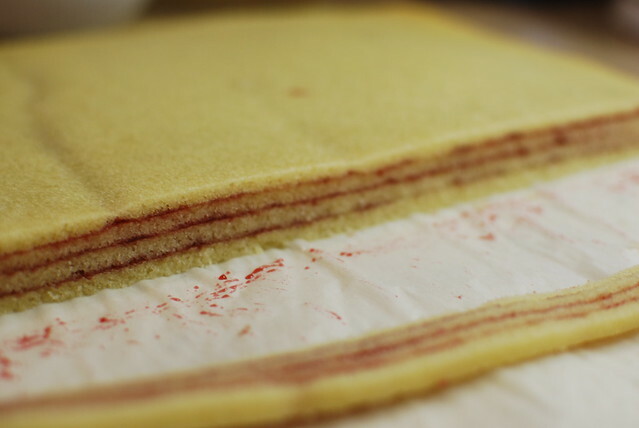 I used 11X17 jelly roll pans, buttered, lined with parchment, and then buttered again. I spread the cake batter, super thin, like 1/4 of an inch or less onto the parchment with an off set spatula. Make sure there aren't lumps or bumps. Bake it at 350 for about 10 minutes. Check it after 8 minutes though. It should be very slightly brown around the edges, and set in the middle. Don't bake it too long! It will dry out and be crumbly. Invert the cake onto a wire rack, peel off the parchment and let it cool completely. 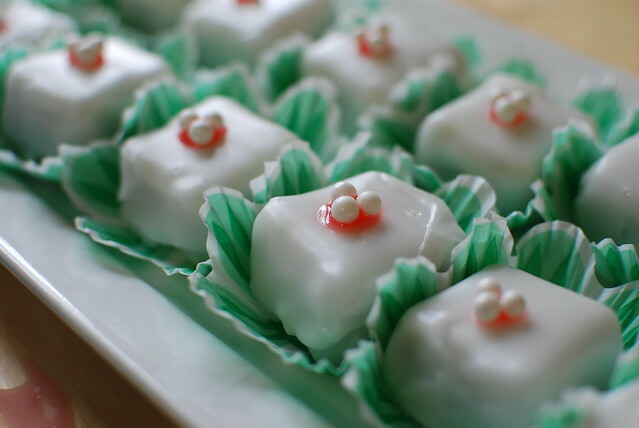 Then I followed this poured fondant recipe. Very very good instruction. Except, she left one very important part out. DON'T touch the sugar when you are dipping the cakes. It is SO Hot!! I kept an ice pack handy because I was the stupid one. Seriously, 150 degree sugar versus my finger tips...whose gonna win? Okay. I added almond extract, which is clear and doesn't change the color of the fondant, and I forgot about the marzapan. I added like 1/2 teaspoon of almond, just enough for that hint of flavor. These were a hit. The product: well worth the effort. The sugar dried onto everything cleans up easily in some warm soapy water. And, I just hope my dentist doesn't find out.